Тема в разделе "СКАМ", создана пользователем All-HYIPs.info, ноя 27, 2018. Наша программа предназначена для людей, желающих получить финансовую свободу, но неспособных сделать это, потому что они не финансовые эксперты. 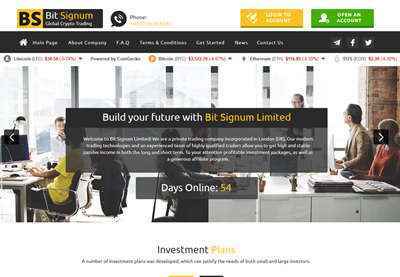 bitsignum.com - долгосрочная программа выдачи частных кредитов с высокой доходностью, подкрепленная торговлей на рынке Форекс и инвестируя в различные фонды и виды деятельности. Прибыль от этих инвестиций используется для повышения нашей программы и повышения ее стабильности в долгосрочной перспективе. 27.11.18 18:33 Transfer Sent Payment: 60.00 USD to account U18672376 from U1294xxx. Batch: 237484423. Memo: Shopping Cart Payment. Deposit to bitsignum.com User allhyips. 03.12.18 06:48;Account;Receive;Received Payment 0.42 USD from account U18672376 to account U1294000. Batch: 238368051. Memo: API Payment. Withdraw to allhyips from bitsignum.com. 04.12.18 05:18;Account;Receive;Received Payment 0.42 USD from account U18672376 to account U1294000. Batch: 238473913. Memo: API Payment. Withdraw to allhyips from bitsignum.com. 05.12.18 05:20;Account;Receive;Received Payment 0.42 USD from account U18672376 to account U1294000. Batch: 238587810. Memo: API Payment. Withdraw to allhyips from bitsignum.com. 06.12.18 04:50;Account;Receive;Received Payment 0.42 USD from account U18672376 to account U1294000. Batch: 238692460. Memo: API Payment. Withdraw to allhyips from bitsignum.com. 07.12.18 04:29;Account;Receive;Received Payment 0.42 USD from account U18672376 to account U1294000. Batch: 238797396. Memo: API Payment. Withdraw to allhyips from bitsignum.com. 08.12.18 04:51;Account;Receive;Received Payment 0.42 USD from account U18672376 to account U1294000. Batch: 238899166. Memo: API Payment. Withdraw to allhyips from bitsignum.com. 09.12.18 18:26;Account;Receive;Received Payment 0.42 USD from account U18672376 to account U1294000. Batch: 239054200. Memo: API Payment. Withdraw to allhyips from bitsignum.com. 11.12.18 06:34;Account;Receive;Received Payment 0.42 USD from account U18672376 to account U1294000. Batch: 239202396. Memo: API Payment. Withdraw to allhyips from bitsignum.com. 10.12.18 18:40;Account;Receive;Received Payment 0.42 USD from account U18672376 to account U1294000. Batch: 239163396. Memo: API Payment. Withdraw to allhyips from bitsignum.com. 13.12.18 05:34;Account;Receive;Received Payment 0.42 USD from account U18672376 to account U1294000. Batch: 239414375. Memo: API Payment. Withdraw to allhyips from bitsignum.com. 12.12.18 05:17;Account;Receive;Received Payment 0.42 USD from account U18672376 to account U1294000. Batch: 239308917. Memo: API Payment. Withdraw to allhyips from bitsignum.com. 14.12.18 05:45;Account;Receive;Received Payment 0.42 USD from account U18672376 to account U1294000. Batch: 239511400. Memo: API Payment. Withdraw to allhyips from bitsignum.com. 15.12.18 07:10;Account;Receive;Received Payment 0.42 USD from account U18672376 to account U1294000. Batch: 239608647. Memo: API Payment. Withdraw to allhyips from bitsignum.com. 16.12.18 05:27;Account;Receive;Received Payment 0.42 USD from account U18672376 to account U1294000. Batch: 239687419. Memo: API Payment. Withdraw to allhyips from bitsignum.com. 17.12.18 17:41;Account;Receive;Received Payment 0.42 USD from account U18672376 to account U1294000. Batch: 239843151. Memo: API Payment. Withdraw to allhyips from bitsignum.com. 18.12.18 17:54;Account;Receive;Received Payment 0.42 USD from account U18672376 to account U1294000. Batch: 239952124. Memo: API Payment. Withdraw to allhyips from bitsignum.com. 20.12.18 06:23;Account;Receive;Received Payment 0.42 USD from account U18672376 to account U1294000. Batch: 240090520. Memo: API Payment. Withdraw to allhyips from bitsignum.com. 21.12.18 18:23;Account;Receive;Received Payment 0.42 USD from account U18672376 to account U1294000. Batch: 240248682. Memo: API Payment. Withdraw to allhyips from bitsignum.com. 21.12.18 05:46;Account;Receive;Received Payment 0.42 USD from account U18672376 to account U1294000. Batch: 240185173. Memo: API Payment. Withdraw to allhyips from bitsignum.com. 22.12.18 19:19;Account;Receive;Received Payment 0.42 USD from account U18672376 to account U1294000. Batch: 240342899. Memo: API Payment. Withdraw to allhyips from bitsignum.com. 25.12.18 18:48;Account;Receive;Received Payment 0.42 USD from account U18672376 to account U1294000. Batch: 240582949. Memo: API Payment. Withdraw to allhyips from bitsignum.com. 25.12.18 06:28;Account;Receive;Received Payment 0.42 USD from account U18672376 to account U1294000. Batch: 240527189. Memo: API Payment. Withdraw to allhyips from bitsignum.com. 24.12.18 08:01;Account;Receive;Received Payment 0.42 USD from account U18672376 to account U1294000. Batch: 240448635. Memo: API Payment. Withdraw to allhyips from bitsignum.com. 26.12.18 18:31;Account;Receive;Received Payment 0.42 USD from account U18672376 to account U1294000. Batch: 240668436. Memo: API Payment. Withdraw to allhyips from bitsignum.com.